Description: Kit includes chart, hand-dyed wool, hand-dyed floss, buttons and needles. 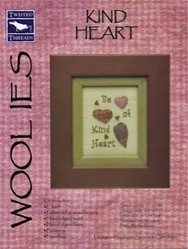 Kind Heart is stitched on 32count Putty Belfast linen by Zweigart from Norden Crafts with one strand of Sampler Threads over one linen thread. There are 2 needles included with this kit. The tapestry needle (blunt point) is used for the cross stitching and the crewel needle (sharp point) is used for blanket stitching the wool to the linen. The double frame is from East Side Mouldings: 3300SA/3100WN 3-3/4 x 4-3/4. 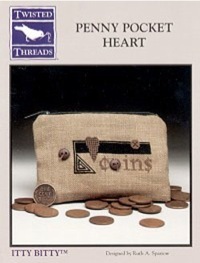 Description: A great companion piece to our Pocketbook Hearts purse, this design includes the pre-finished coin purse with 32 count Summer Khaki linen by Zweigart from Adam Original and two hand-dyed buttons from Hillcreek Designs. 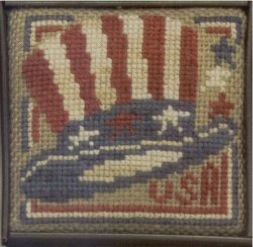 The design is stitched over one linen thread with Anchor floss. Description: This kit includes 32 count Dirty Belfast linen by Zweigart from Norden Crafts, hand-dyed fibers from Weeks Dye Works, and the chart. This design is stitched over one linen thread. Specialty stitches include four-sided stitch, long arm cross, smyrna, and checker stitch. Ours is framed in an Olde Colonial Designs frame (3522). Description: Kit includes 30 count hand-dyed O'Neill Green linen from R&R Reproductions, Gentle Arts Sampler Threads, Woolly Whites from The Thread Gatherer, tapestry needle. Stitched over 2 linen threads. Description: Kit includes 30 count hand-dyed Ruth's Spruce linen from R&R Reproductions, Gentle Arts Sampler Threads, Woolly Whites from The Thread Gatherer, heart button from Just Another Button Company, tapestry needle. Stitched over 2 linen threads. Description: Kit includes 32 count Spruce Green Belfast by Zweigart from Norden Crafts, Sampler Threads from The Gentle Art, Woolly Whites from The Thread Gatherer, chart and tapestry needle. Stitched over one linen thread. 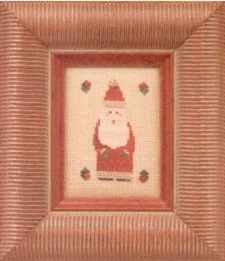 We put ours in an itty bitty tin frame (TF02)from Twisted Threads. 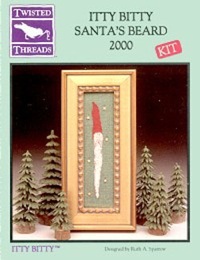 Description: Itty Bitty Santa's Beard 2000 is the 4th annual Santa's Beard designs from Twisted Threads. This kit includes 32-count Spruce Green Belfast linen by Zweigart from Norden Crafts, Sampler Threads, Anchor floss, 6 star charms, tapestry needle and chart. All cross stitch is done over one linen thread with one strand of floss. Frame by Olde Colonial Designs. 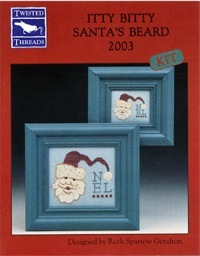 Description: Itty Bitty Santa's Beard 2001 is the fifth in an annual series in tribute to Santa! The kit comes complete with 32 count Summer Khaki Belfast linen by Zweigart from Norden Crafts, eight colors of Sampler Threads from The Gentle Art, chart and tapestry needle. This design is stitched over one linen thread. 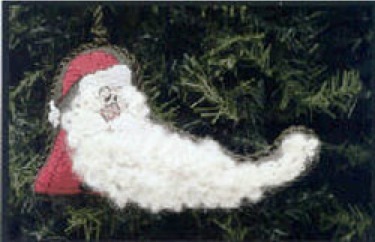 The trim on Santa's coat is stitched using smyrna cross and the holly berries and tassel on Santa's cap are colonial knots. Ours is in an Olde Colonial Designs frame. Description: This kit comes complete with 28 count Antique White Melrose patterned linen from Norden Crafts and hand-dyed Sampler Threads from The Gentle Art. 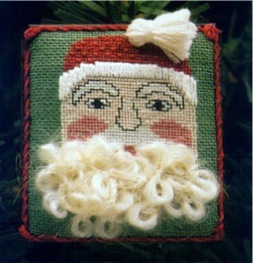 All cross stitch is done with one strand of floss over one linen thread. This is the sixth annual design in the Santa's Beard series. Description: This kit comes complete with 32 count Lavender Mist Belfast linen by Zweigart from Norden, Kreinik Mori Milkpaint Silk and a unique sterling silver heart charm (CH06) by Twisted Threads. 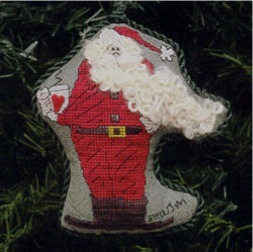 All cross stitch is done with one strand of floss over one linen thread. Description: This kit comes complete with 32 count Dirty Belfast linen by Zweigart from Norden Crafts, Anchor floss, hand-dyed Sampler Threads from The Gentle Art and the tin pin (TF05) to finish this design to wear. All cross stitch is done with one strand of floss over one linen thread. Description: Stitched on 32 count Dirty Belfast linen by Zweigart from Norden Crafts with one strand of hand-dyed floss from Weeks Dye Works over one linen thread, this patriotic design uses the scotch stitch in the star. 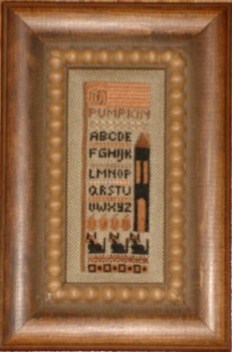 This design includes the tin pin (TF05) from Twisted Threads. 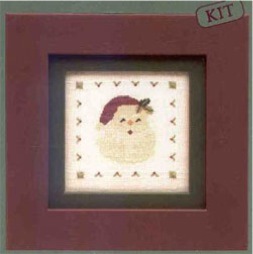 Description: We love our Tin Pin collection of wearable cross stitch. This design includes the TinPin (TF04) from Twisted Threads. 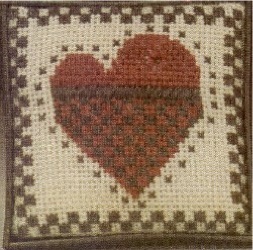 Tin Pin Heart is stitched on 32 count Platinum Belfast linen by Zweigart from Norden Crafts with one strand of hand-dyed floss from Weeks Dye Works over one linen thread. Specialty stitches include diagonal satin stitch and eyelet. Description: Stitched on 32-count Natural Belfast linen by Zweigart from Norden Crafts with one strand of Anchor floss over one linen thread. 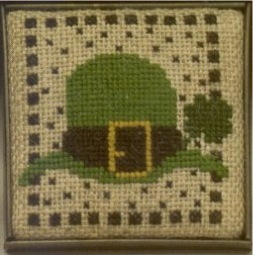 St. Pat includes the tin pin (TF04) from Twisted Threads. Description: 32 count Dirty Belfast linen from Norden Crafts with one strand of hand-dyed floss from Weeks Dye Works over one linen thread. This design includes the tin pin (TF04) from Twisted Threads. Description: This kit comes complete with 32 count Natural Belfast linen by Zweigart from Norden Crafts, seven colors of hand-dyed fibers from Weeks Dye Works and the tin pin to finish this design to wear. All cross stitch is done with one strand of floss over one linen thread. Specialty stitches include Double Leviathan, Rice, Scotch, Rhodes and the Spider Web Rosette. 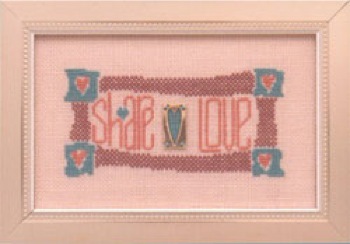 We love this little house sampler and want you to know that it was designed just for ""you and me""! 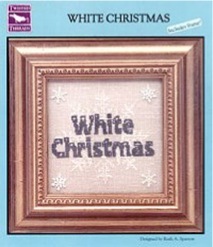 Description: White Christmas comes with the frame from Olde Colonial Designs. Stitched on 32-count Rue Green Belfast linen by Zweigart from Norden Crafts with Anchor floss and snowflake Treasures from Mill Hill.